Welcome to the Health and Fitness Experts video series. I’m Francis and today we’re going to talk about the calories in vodka and what you can do to minimize them. So, just how many calories are there in vodka? Well the short answer is that there are about ninety seven calories in a typical shot or jigger of vodka. And for those of you who don’t know, a shot or a jigger is about one and a half ounces of vodka. That’s the same amount of vodka that you typically find in a mixed drink or in a vodka cocktail. Now, almost all the calories in vodka come from the alcohol. That means that lower alcohol content vodka has fewer calories than higher alcohol content vodka. And for vodka, and most liquor, the alcohol content is listed right on the label, either as the percentage of alcohol or as the proof. And the proof is simply double the percentage of alcohol. For example, most vodka sold in the United States is forty percent alcohol. That’s the same as saying that it’s 80 proof. It’s important to realize that when it comes to calories in vodka, it really doesn’t matter what brand of vodka you drink. Since all the calories are in the alcohol, all brands with the same alcohol content, or all brands with the same proof, all have the same number of calories. Now, most people don’t drink shots of vodka. Instead they mix their vodka into cocktails. And there are certainly a lot of very tasty cocktail recipes out there. 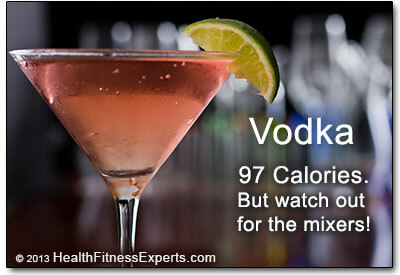 But it’s the mixers that can add a lot of calories to your vodka drinks. And that’s because the mixers are often very high in sugar. In fact, some of the most popular mixers can almost double the calories in your drink. For example, if you mix your vodka with cranberry juice to make a popular drink known as a Cape Codder, you’ll boost the calorie count all the way up to 185 calories. Ouch! That’s a lot of calories for one drink. 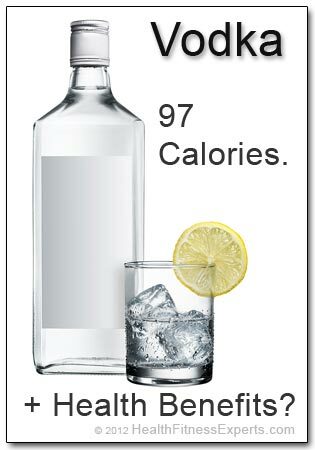 So what can you do to minimize the calories of your vodka drinks? Well you really need to watch out for the mixers. If your vodka cocktails are full of simple syrup, soft drinks, or fruit juices, you’ll be drinking a lot of the empty calories. So to keep the calorie count low, try things like substituting club soda for tonic or soft drinks, and add just a splash of fruit juices for some flavor. Well that’s all for this episode. But you can find a lot more at our Health and Fitness Experts website. We’ve got articles and videos on low-calorie and low-carb vodkas, we’ve got vodka cocktail recipes, and we even have info about the health benefits of drinking vodka. Yes, there are health benefits, as long as you drink in moderation. Our website also has tons of useful tips on diet, exercise and nutrition that will keep you healthy and fit. Thanks for watching, and we’ll see you next time. There are 97 calories in a shot or jigger of vodka. But mixers can double the calorie count. Use our tips to keep your vodka calories low! But be careful with your mixers, or you’ll get many more calories than you expected! Our tips (below) will help you keep your vodka low-calorie. But first, let’s take a closer look at the source of vodka calories and explain why all vodka is created equal — at least when it comes to calories. Almost all the calories in vodka come from the alcohol, so it doesn’t matter what brand of vodka you are drinking. of calories. See below for more info. 80 proof = 40% alcohol. But what does matter is the proof! Proof refers to the percent of alcohol in the vodka. Proof is defined as twice the percentage of alcohol by volume. Most vodka sold in the U.S. is 80 proof, which is 40% alcohol. But specialty vodkas can range from 60 – 100 proof. So just how many calories are there in vodka? Well, a standard 1.5 oz (44 ml) shot or cocktail jigger of 80 proof vodka has 97 calories. Take a look at our Vodka Calories Chart to see the calories for different vodka proofs and amounts. Counting Calories? Watch Out for the Mixers! When you add vodka to a cocktail, your 97 vodka calories can quickly rise to 150 calories — or much more if you are getting really fancy drinks. Mixers are often very high in sugar and calories, so be cautious! How many calories in vodka? About 97. But watch out for the mixers — they can double your vodka calories! For example, tonic is one of the most common mixers. But Canada Dry Tonic water is full of high fructose corn syrup. So every ounce adds 2.9 grams of sugar and 11 calories. That boost the calories of your Vodka Tonic cocktail from 97 to 147 calories. How about mixing your vodka with Ocean Spray 100% Juice Cranberry to make a Cape Codder? That’s 4.5 grams of sugar and 17.5 calories per ounce, and it will boost your cocktail to 185 calories. Ouch! Although low-calorie vodka is a myth, low-calorie cocktails are definitely not. As we said, the mixers in a cocktail can double or even triple the calories. But here are a few tips to keep the calories under control. Most tonic waters are full of high fructose corn syrup. Try club soda instead — it’s got zero sugar and zero calories. But it also has zero taste and zero sweetness. Read on if you need something to sweeten things up a bit. If you want to add some flavor and a little sweetness, use a splash of fruit juice. But avoid juices that have extra sugar added. And don’t add too much fruit juice. Even if it’s 100% juice, it’s likely to be high in calories. And when you are drinking juice, you don’t get the full benefit of the fiber, vitamins, and antioxidants that you’d get if you ate the fruit whole. Agave nectar is a natural sweetener that comes (of course) from the agave plant. It’s been more famous as the plant used to make tequila. But it also makes a good natural sweetener because it makes your taste buds think it’s sweeter than sugar — so you can use less of it. It tastes about 50% sweeter than sugar, so you can typically substitute any sugar with half to two-thirds the amount of agave nectar. It’s still got carbs in it, so this is not a sugar-free substitute. But it’s got only about 3 calories per gram compared to 4 calories per gram for sugar. And you can use 50% – 75% less of it to get the same sweetness as sugar. So it can really save some calories. You Might Try Truvia or Stevia? Sweeteners like Truvia that are made from the stevia plant might be a good alternative. But we haven’t done our research on this yet, so we can’t yet recommend them. These sweeteners boast that they are natural and that they have zero carbs and zero sugar. That sounds good, but typically it’s not good to trick your body. If your taste buds think they are getting sugar, it will kick off several biological reactions. But there can be some negative consequences when the sugar never arrives. We’ll add an update here once we’ve taken a closer look at stevia. Vodka has 97	calories. Vodka also has health benefits – but only when you drink in moderation. It’s unlikely that you are drinking vodka just because you want to be healthy. But you may not know that drinking vodka actually has quite a few health benefits, from boosting your cardiovascular health to boosting your brain power. The key is that you drink in moderation! If you drink in excess, then any alcohol becomes very bad for your health. Do you have some tips or recipes for your own low-calorie vodka cocktails? Do you have an opinion on agave nectar, Truvia or stevia? We’d love to hear it, so leave a comment below. New York: Dow Jones & Company, Inc. Non flavored vodka has the lowest calories, yes? I like 42 Below vodka. I think it’s the best.